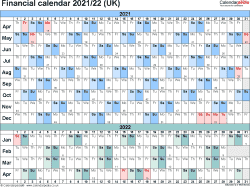 Financial calendars for the tax year 2021/22 for the United Kingdom as templates in PDF format to download and print. 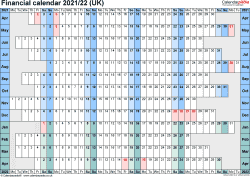 The calendars are 13 months long – running from April 1st, 2021 to April 30th, 2022 – to cover the period used for corporation tax and government financial statements (April to March) and also the personal tax year which starts on April 6th, 2021 and ends on April 5th, 2022. Years are marked in different colours for easy at-a-glance reading and identification. 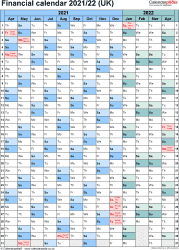 The tax year calendars are suitable for use as a general financial planner, financial year planner, monthly or yearly financial planner, tax year planner, tax payment calendar, payroll calendar and other financial purposes. 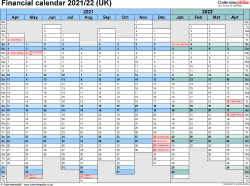 The calendars can be used to keep track of and remember such important issues as the payment dates, due dates and deadlines for HMRC cheque and BACS payments, NIC payments, due dates for employee forms (P60, P11D, P9D, P42 etc. ), and as a reminder for when paper and online self-assessments must be submitted. 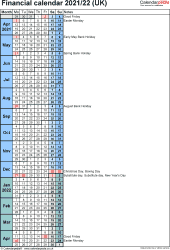 The calendars are completely flexible and adjustable and suitable for any large business, small business, company, trading house, shop, wholesale or retail business, partnership, sole trader, corporation, institution, society or establishment running a payroll and requiring tools to assist with financial, tax and payment planning. 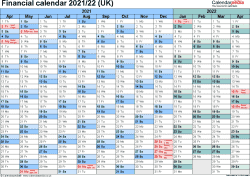 See also: further information about the financial year in the UK which also explains the odd dates of the UK tax year.